Metal roofing and components provide substantial advantages to both businesses and homes throughout New Orleans. However, many people hold off on this type of roofing because of the need for customization. Their immediate thought is that they won’t be able to find a provider that can offer custom metalwork, or if they do, that the rates charged will be exorbitant. However, JOI Roofing offers an immense range of customization possibilities, from sheet metal to copper and more. Why is custom metal fabrication for New Orleans homes and businesses necessary? Custom work can be necessary for any number of reasons. For instance, custom-built homes often have unique roofing requirements that cannot be met by mass-produced sheet metal or other roofing materials. In addition, very large commercial jobs often require more than what is possible through standard roofing solutions, necessitating custom metalwork. Finally, you’ll find that historic homes and buildings throughout the city can benefit from sheet metal fabrication. New Orleans is rich in historic buildings, and they all have unique roofing needs. Customization is the only way to ensure that each building has the right roof to protect it for the long term, as well as to uphold its historic aesthetic. 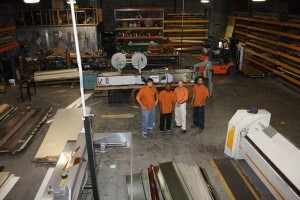 At JOI Roofing, we have the experience and expertise to supply sheet metal fabrication to fit any needs. Moreover, we can provide services for a range of different metals. While steel sheet metal customization is the norm, we also offer custom copper work. Copper is a beautiful, durable metal that can provide both stunning looks and long-term protection for homes and businesses. It’s an ideal solution for use over windows and doorways, as well as for accents on a home or business’ roof. Awnings, gutters, cupolas, vents and much more can be custom made to each need. Finally, at JOI Roofing, we believe that providing our customers with the highest quality custom work is important. To that end, we ensure that our contractors undergo ongoing education. We partner with leading roofing manufacturers around the country, and our contractors are fully trained in installing and repairing virtually any type of roof out there. We also have a full in-house customization and fabrication shop – your needs are never outsourced, as we do everything right here on the premises. That offers our clients peace of mind and the quality they deserve.